The Millennial Generation (also known as the Y Generation), as every new generation comes of age, is a topic of some angst for business executives responsible for finding qualified and responsible employees. Born starting in the early 1980s, the leading edge of the generation are now in their early thirties. Employers have noticed a change in work attitude different from the previous X Generation. Statements like, “I don’t have time to coddle these kids,” “They think work is supposed to be fun,” and “They always want approval from supervisors. We’ll tell them when they screw up,” are not uncommon from the Baby Boomers, and Generation Xers who manage them. Exacerbating the problem is the economy, which has delayed entrance to the workforce for many and created many college graduates with no work experience at all. This is the subject of one of the 6 break-out sessions offered at the Manufacturers’ Summit on February 21, 2014 at the Ontario Convention Center. Jon Burgess, V.P. of RedFusion Media and District Governor with the American Federation of Advertising, opens the session with an overview of Millennials. Betsy Lamb, Vice President of Organizational Planning with CalPortland Company, will then relate how CalPortland Company is experimenting with ways to adapt to Millennials. Ms. Lamb said “our intern program is a way to get young people thinking about manufacturing, while we learn how to adapt to them.” The company is working on ways to incorporate “smart” technology devices such as iPhones and iPads into the task stream, hoping to relate work to the technology they find so necessary. 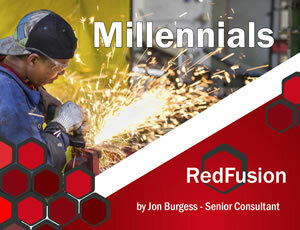 Go to http://www.redfusionmedia.com/arc_managing_generation_Y_millennials.htm for a well-sourced and highly referenced article on Millennials, by Jon Burgess. Fill out the form below to have the presentation emailed to you.